This is a revised version of an article commissioned in 1998 by a publisher for a book to commemorate the fiftieth anniversary of Sri Lankas Independence. As it happened, the publication did not come off but that explains how this paper has grown through several re-workings over the past few years. Dr. Ananda Coomaraswamy, with his sweeping command of the subject, simplified the whole business of art in a profound aphorism. He wrote: Nations are made by artists and poets, not by traders and politicians. Art contains in itself the deepest principles of life, the truest guide to the greatest art, the art of living. It is in the light of such a proposition that I took it to be a good idea to take stock of our achievements and, where necessary, to admit our failures. It could well be argued that, at the moment, there are far more urgent needs to be dealt with in a country which suffers from endemic poverty and many social ills and is embroiled in a disastrous military conflict. Art, it can be said, is a luxury the country can ill-afford. Indeed, it may well be that some will consider the matters I propose to raise here to be irrelevant or of little importance in the overall context of Sri Lankan affairs. Needless to say that while I appreciate these objections, I do not subscribe to them. I consider them to be short-sighted. I agree rather with Coomaraswamy. Artistic achievement reflects the soul of a people and as such merits honour and respect. It demands that the best efforts possible are made to protect past achievements and to foster a renewed and further flowering of artistic endeavour. 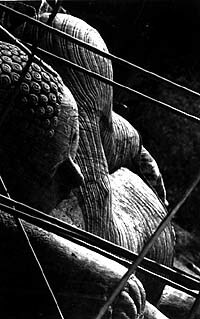 My interest lies in the art of Sri Lanka created since the earliest times by architects, sculptors and painters at Anuradhapura, Sigiriya and Polonnaruwa; in mediaeval times and near-modern times in the eighteenth and nineteenth centuries in Kandy and the south; and in the work of our own contemporaries. These are means of contemplating times of joy and prosperity and times of failure, pain and suffering. This is art which could inspire and encourage us to raise our minds to greater things. It could put us in perspective to see ourselves in relation to time and place, and in respect of honour and achievement. These are spiritual considerations. (And if I do not elaborate on the point here, my discussion includes the works of the poet, the writer and the dramatist, the dancer and the drummer, the singer of songs, and so on). It is in direct proportion to our capacity to appreciate these works of the past that we can develop attitudes capable of improving the conditions of life as they exist around us today. It is a truism, of course, that much has been achieved in Sri Lanka and its works are an enduring witness, whether these be reservoirs in immense irrigation schemes or serene images of the Buddha carved in living stone. My concern is over the need to preserve what remains of these achievements. I fear that a great deal could be lost through zealous but ignorant attempts at improving upon classical works. Well-meaning but ill-advised patrons of temples have already destroyed the integrity of some works. Because many of these places remain hallowed through the devotion of adherents they are doubly sacred. They retain their value as works of antiquity and are yet susceptible to the autocracy of their incumbents. The new entrance to the Dambulla temples is a striking example. We need to put our energies not to embellishing nor even to restoring (and thereby indulging in arbitrary reconstruction), however well-meaning or scholarly such attempts might be. Our business must be to preserve for future generations the pleasure of discovering and enjoying these great works of the past, just as it has been our privilege, in our time, to discover and enjoy them. Obviously these are enormous undertakings needing a legion of talents which, I dare say, are available in Sri Lanka. If they are not, surely then this is an area of expertise that must be addressed and such skills as are necessary acquired at the right hands. It brings to mind the tragic defacement of the frescoes at Sigiriya in October, 1967. Archaeological Department conservation staff had begun cleaning the paintings when the International Centre for the Study and Preservation of Cultural Property (a branch of UNESCO) based in Rome was asked to help. They engaged Luciano Maranzi, an expert, to come to Sri Lanka. His experience and expertise combining with local talent led, in the first place to the removal of the green paint that had been daubed over the paintings but not all of it has been successfully cleaned. There is just a hint of the vandals paint showing. Two or three figures were hacked away from the walls. No attempt has been made to replace them but work was undertaken to stabilize the wall plaster. What there remains has been conserved. I believe Mr. Maranzi was also asked to clean the Degaldoruwa murals but only as small portion was treated. These are processes in conservation. Something of this order is called for in preserving the 18th century murals of Kandy and the south coast temples. The excavation that is being carried out at Sigiriya, revealing its wonder and enhancing our amazement, is a splendid example of what can be done. There are many other problems facing the archaeologist but I do not pretend to have the answers to them. How does one halt the deterioration of ancient buildings? There have to be better means than the erection of corrugated iron canopies over them. How appropriate is the structure that covers the Samadhi Buddha statue at Anuradhapura? Not at all. How awkward are the metal awnings at the Gal Vihare in Polonnaruwa? Absolutely. Surely what is called for above all else is an appreciation of these works in themselves as the expression of high spiritual values? From it will emerge a solution that is based on the aesthetics of their situation, their ambiance - for want of a better word. Respect and regard are others. We could, in fact, regain some self-respect and win universal acknowledgment of our achievements if we are ourselves sensitive to their beauty and treasure them. Is a past, made up of ruined cities and temples, crumbling murals and broken statuary, all we have to celebrate? These great works are to be treated with awe, preserved and venerated and there is so much more. The burden of my argument is that Sri Lanka requires urgently a showcase for the enormous variety of works, in all sorts of materials, that constitute our inheritance. We need a place to show the works, past and present, of the bronze-worker and stone carver, the carpenter and cabinet- maker, the jeweller and goldsmith, the potter and the wood-carver, and the weaver of fabrics and dyer of cloths. Though seemingly mundane and fulfilling no greater purpose than being useful, they are, nonetheless, made with great care and imbued with traditional integrity. These are practical and everyday aids to living. They are objects expressing the joy of the artists craftsmanship and representing his contribution to the quality of life. They are not relics. And then there is the work of painters, sculptors and photographers. There is no institution now in Sri Lanka so constituted as to be a permanent repository of the countrys works of art (among which I make the important point of naming the products of craftsmen). The so-called Colombo Art Gallery in Ananda Coomaraswamy Mawatha has, for many years, pretended to be the national establishment. It has certainly enjoyed the patronage of the Establishment. It is a dingy building in a pseudo-Kandyan style with not a great many compelling items in it, perhaps thirty paintings on canvas all in a dismal condition, the collection of the Ceylon Society of Arts. There was another national collection made in the 1950s under the aegis of the Arts Council of Ceylon but whatever happened to that I have had no means of discovering. The Colombo Museum has had the potential to become the showcase of the arts of Sri Lanka. Individual items in the museums collection are priceless. 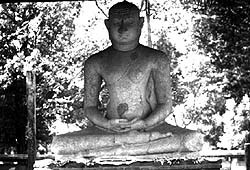 It is worth a visit if only to see the Polonnaruwa Bronzes if you do not mind the gloom and the cobwebs that hang over them. The museum has never, in my recollection, been interested in displaying its treasures in a meaningful and appropriate way. On a recent visit I found even the simple labelling of exhibits had been neglected. The cards, where they still existed, told us little. Try looking for Dutch plates: none can be recognized because not a single piece is identified. Try looking for Dutch furniture: not a stick is to be seen. (By contrast, the National Museum of India in New Delhi treats every item in its collection, however common, as though it were their finest and rarest treasure. Each is perfectly lit and each has comprehensive legends in Hindi and English. The presentation is a rare pleasure in itself). The want of identification - whether through a lack of knowledge or because of a lack of interest is hard to say - is most frustrating. I found this particularly appalling because the museum is still on the required itinerary for schoolchildren on their one day in town.